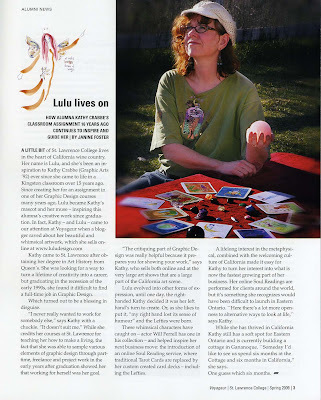 St. Lawrence College Alumni Magazine - I'm featured in the Spring 2009 issue! I was thrilled to be featured in the Spring 2009 Alumni News section of Voyageur, my College Alumni Magazine. Kathy came to St. Lawrence after obtaining her degree in Art History from Queen’s University. She was looking for a way to turn a lifetime of creativity into a career, but graduating in the recession of the early 1990s, she found it difficult to find a full-time job in Graphic Design. Which turned out to be a blessing in disguise. "I never really wanted to work for somebody else,” says Kathy with a chuckle. "It doesn’t suit me." While she credits her courses at St. Lawrence for teaching her how to make a living, the fact that she was able to sample various elements of graphic design through part-time, freelance and project work in the early years after graduation showed her that working for herself was her goal. "The critiquing part of Graphic Design was really helpful because it prepares you for showing your work," says Kathy, who sells both online and at the very large art shows that are a large part of the California art scene. Lulu evolved into other forms of expression, until one day, the right handed Kathy decided it was her left hand’s turn to create. Or, as she likes to put it, "my right hand lost its sense of humour" and the Lefties were born. These whimsical characters have caught on – actor Will Ferrell has one in his collection – and helped inspire her next business move: the introduction of an online Soul Reading service, where traditional Tarot Cards are replaced by her custom created card decks – including the Lefties. A lifelong interest in the metaphysical, combined with the welcoming culture of California made it easy for Kathy to turn her interest into what is now the fastest growing part of her business. Her online Soul Readings are performed for clients around the world, but it’s something she recognizes would have been difficult to launch in Eastern Ontario. "Here there’s a lot more openness to alternative ways to look at life," says Kathy. While she has thrived in California Kathy still has a soft spot for Eastern Ontario and is currently building a cottage in Gananoque. "Someday I’d like to see us spend six months at the Cottage and six months in California," she says. One guess which six months.